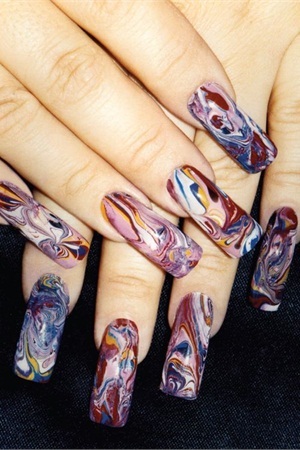 There are two ways to give your clients a striking, marbleized polish design, says Jessica Zastoupil, an instructor at Scot Lewis Schools in Plymouth, Minn to do the first - the :dry marble” techniques, as she calls it - begin by polishing the nails. 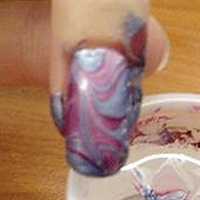 Then, while the polish is still wet, take a second and possibly a third color and place dots on the nail. Then use a stylus or toothpick and swirl them together. The second technique - which she calls the “wet marble” since it involves dipping the nail in water - is her favorite. Prepare the nails with a base coat. You may want to apply a layer of white on the nail so that any colors you put over it will appear brighter. Open all the polishes you’re going to work with (two or three is best) Working quickly, place a drop or two of the first color in the water. It will spread out in a circle. Do the same with your next color, placing it inside the circle formed by the last color. Repeat for any additional colors. Now dip the nail keep the finger using your pin before you pull it back out. Repeat on all fingers. Eventually you will be able to do several at a time and not waste so much polish. Use acetone to clean up around the fingers and cuticle area.